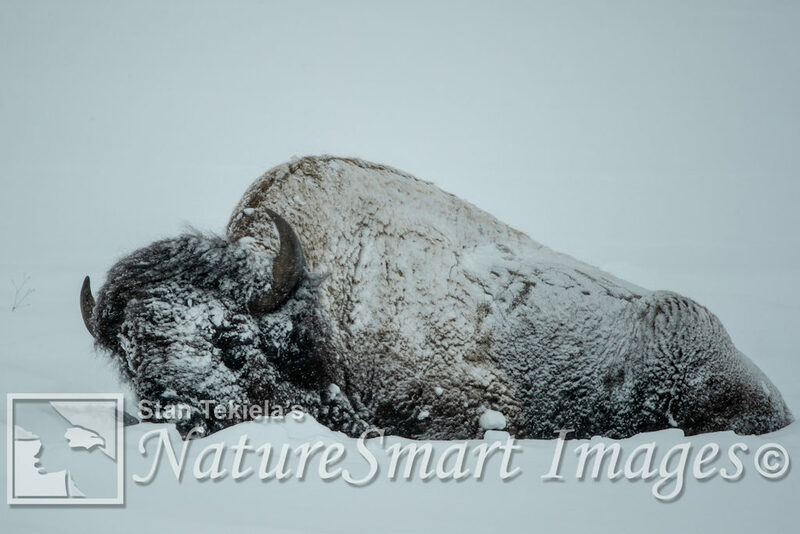 Each winter, Stan Tekiela leads a photography group to Yellowstone National Park, and at the top of the list for most participants is capturing an image of an American Bison. This iconic image of the “frosty bison” usually involves a large bull bison standing near a hot spring, covered in frosty crystals. 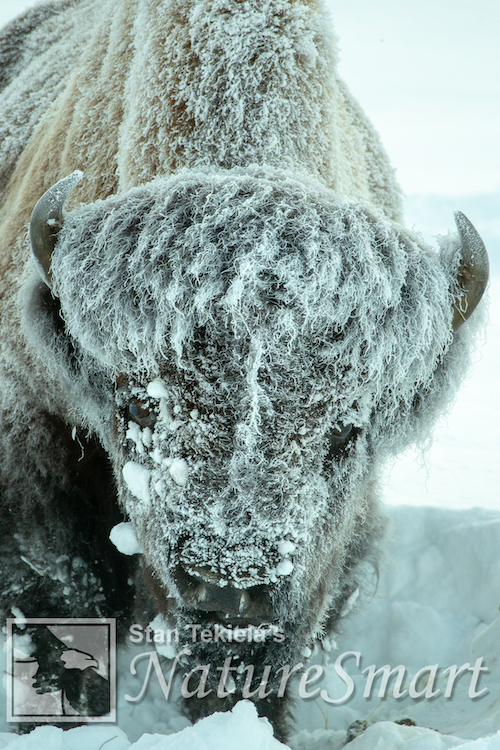 Well, during his last trip, Stan found more than a frosty bison—he discovered a snow-encrusted bison. This, of course, got him thinking about how these bison can survive extreme cold and deep snow. Read on. The American Bison (or simply Bison) is sometimes call a buffalo. However, the name buffalo is not correct because the American Bison is not related to the Old World Buffalo or the Asian Water Buffalo. While all these animals are in the Bovidea family, they are not closely related. The American Bison’s closest living relative is the European Bison, which is found only in a handful of northern European countries. Estimates say there are less than 1,500 European Bison alive today. (1 ton) and stand over 6 feet tall at the shoulder. Females, called cows, are about half that size. Yellowstone National Park is the only place in the U.S. where Bison have continuously lived since prehistoric times. These Bison are special, in that they are the pure-blooded descendants of early Bison that roamed before the existence of humans. There are approximately 5,000 Bison in Yellowstone today. An estimated 20 to 30 million Bison once roamed the U.S. from the Appalachian Mountains to the Rockies and from the Gulf of Mexico to Alaska. By the year 1890, they were down to just about 1,000, all at the hands of people. Chock up another blunder to humans. My trip this year coincided with the Polar Vortex that gripped the upper states. Temperatures were crazy cold and over 30 inches of fresh snow had fallen in the days leading up to my visit. 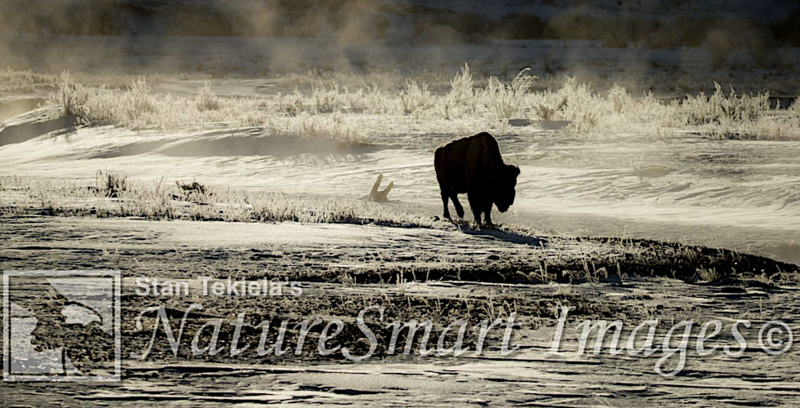 Winter definitely tests the endurance and survivability of Bison. But they are well adapted to the snow and cold. During fall and early winter, the skin or hide of the Bison thickens to over 1-inch thick. Also, they develop a layer of fat just below the hide for added insulation. In addition, Bison grow an extra-thick winter coat of fur with an especially dense undercoat that doesn’t allow any body heat to escape. Therefore, a Bison can be completely covered in snow and yet none of the snow melts. To get rid themselves of snow, they simply stand up and shake. Also, under very cold stress, Bison minimize their nutritional needs and slow their metabolism to conserve energy. They cut down the amount of food they eat, and the grass that they do consume spends more time in their stomachs. The dried grass available in wintertime has less nutrition, so it spends more time in the digestive process to extract every possible ounce of energy. In winter, Bison move to areas that give some protection from the winter elements. They also gather in places where there is more grass beneath the snow. In order to get to the dried grass, Bison use their massive heads and incredibly strong neck muscles to push or plow the snow away. This is a slow and methodical process of sweeping their massive heads back and forth, pushing the snow to the side to get deep enough to reach the dried grass. Another strategy for surviving winter is to lay down in deep snow, using the snow depth as an insulating blanket or wind break. Surprisingly, snow makes excellent insulation against air temperatures that often plummet well below zero. There was one particularly large bull that employed these techniques and allowed us some great photographic opportunities. On several occasions, while photographing this huge bull in the snow, I was asked by the trip participants if I was sure this bull was alive. It would just lay there and not move. I would explain the survival strategies of the Bison again. Eventually, the big bull would get up and go about moving snow and feeding. It left us all in awe to witness the survival skills of wildlife. If you enjoyed Stan’s post, sign up for our newsletter now for more great stories and information on our latest wildlife books.